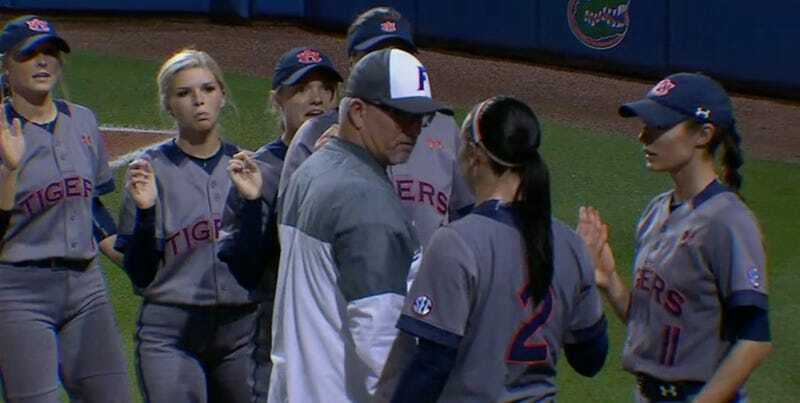 Auburn’s softball team beat Florida 1-0 yesterday, and after the game Tigers shortstop Haley Fagan got into it with Florida head coach Tim Walton. There is some history here that might help explain the incident. Fagan’s sisters played softball at Florida back in 2012, but they were both cut by Walton following an incident that their father described as “an altercation on the team.” It’s not that surprising then that Haley Fagan wasn’t eager to shake Walton’s hand, or that Walton was prepared to meet the snub with a little shove. Whatever the case, coaches shouldn’t be putting their hands on players.